Nowadays, even before going to schools for admission, parents and children browse the website first and then take the decision. If anyone browses your website, then they should have a feeling of satisfaction. And for this purpose, we present you 5+ school WordPress themes. 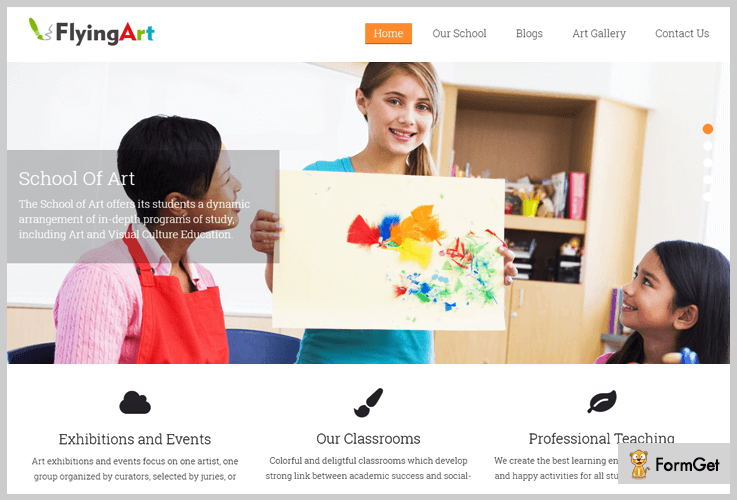 These school themes can be a great choice for websites of kindergartens, playschools, art schools, etc. Using this theme, you can offer images, videos, service section, blog posts, etc, on your website. Some of the distant features are sliders, portfolio and gallery section, blog section, different color schemes and much more. We handpicked some of the best 5+ school WordPress themes for your website. 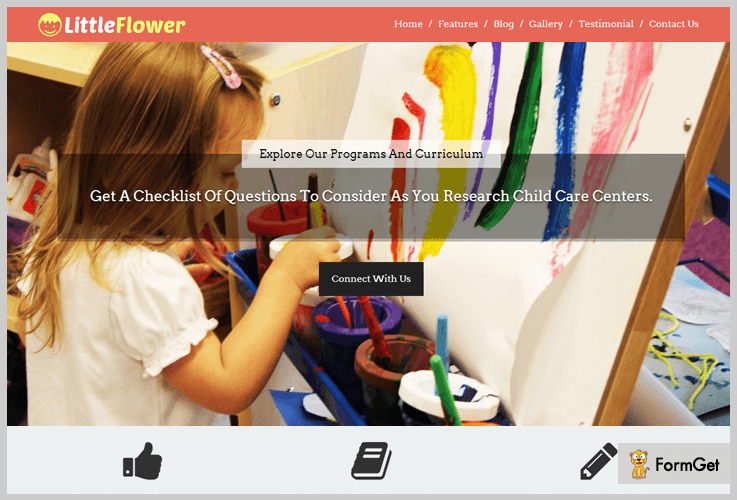 LittleFlower preschool is one of the most suitable school WordPress themes for kindergartens, schools, playschools, etc to create a website. This theme offers you advanced features like navigation menu, 3 column featured area, slider and a lot more that will help you to create a simple and easy to use website. The price of this school WordPress theme is $79 only, despite the fact that it is a one-page theme. It has 3 column featured area where you can showcase your services by adding text & icons. Using its portfolio section you can display the images of school events, children, etc. In this theme contact form is also available, which will help parents and guardians to approach you any time. You can add your school’s logo and tagline. Also, it has a full-width slider where you can add images with descriptions. This premium theme, help in the creation of websites, which can be used by owners of playschools, daycares, kindergarten and more. Most importantly it has a “tap to call button” which helps anyone to connect with you easily. Along with that, it also has a navigation menu with a full-width slider. You will have 24*7 support system, lifetime accessibility and a lot more at $79 only. In this theme, you will have a blog section in which you can write blogs on studies, events, childcare tips and more. You can use the widgetized area to display the address of your institute, and also you can add social sharing buttons. It has a full-width slider where you can showcase images as well as you can add their description. Moreover, this theme also has a testimonial section where you can display the warm words of parents and children. RoseFlower theme is designed to serve for the websites of high schools, colleges, universities, etc. 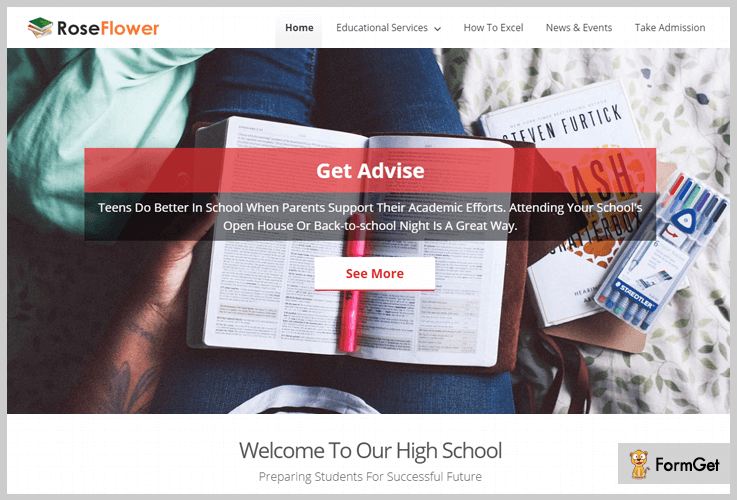 It is a premium high school WordPress theme with distant features like – a featured area with hover effects, navigation menu, WPML compatible and more. You can also integrate this theme with lead capture plugin, as it will help you in adding custom form fields, checkboxes, and radio button. All the leads collected will directly store in WordPress dashboard. This theme is highly responsive to all screen devices, SEO optimized and cost you only $79. This theme has set of 8 unique color schemes. Also, it has multiple drop-down menus which help you to represent all departments of school separately. Already, this theme is integrated with video advertisement feature, which will help you in increasing the news on school events and competitions. It has a widgetized footer area where you can add social buttons for sharing, your contact details, address and more. Also, it has a 4 column featured area with a flip display and a variable full-width slider. Anyone who has an art school, a coaching where they teach students how to sketch, paint, etc can use this theme to create his/her own website. With this theme, you can add your business logo and tagline. Also, you can have a custom menu, boxed slider, and more. It has multiple page templates like – blog page, contact page, & full-width page. And blog posts formats like – video posts, gallery posts, quote posts, etc. 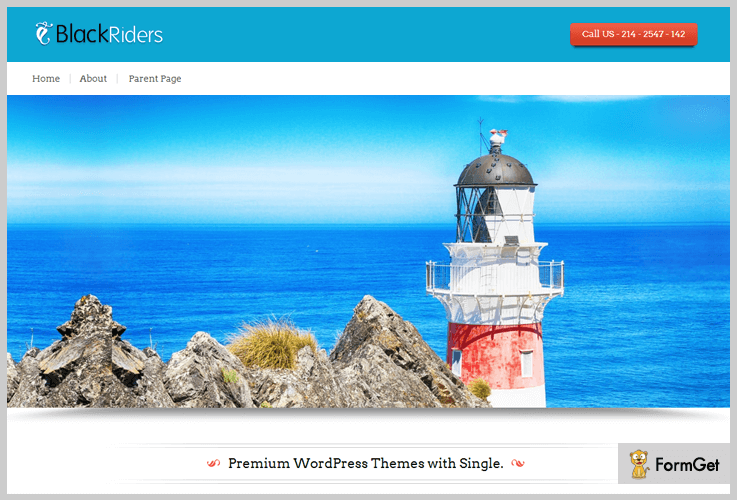 With latest WordPress compatibility and outstanding support services, this theme cost you only $79. You can show the warm and sweet words of your students and their parents in a testimonial section. It has a slider where you can add many images whether of paintings, teachers, students, etc, with description. Also, you can create your own portfolio by adding images and most importantly this theme provides you a portfolio slider as well. In this theme, you will also find an action area, from where new students can take admissions, as this area has a call to action button. This theme has its own features as it can help you in creating a website with all the necessary features provided by the paid ones. Some of them are – tap to call button, 5 widgetized area, full-width slider, and more. Black Rider theme has many features which can leave you stunned, and as a fact, it is freely available. It has 4 featured area with hover effects. You can write blogs and posts all the latest updates. In this theme, comments are organized in a well threaded way. Also, it has an optional 1- column page template which can remove the sidebar. 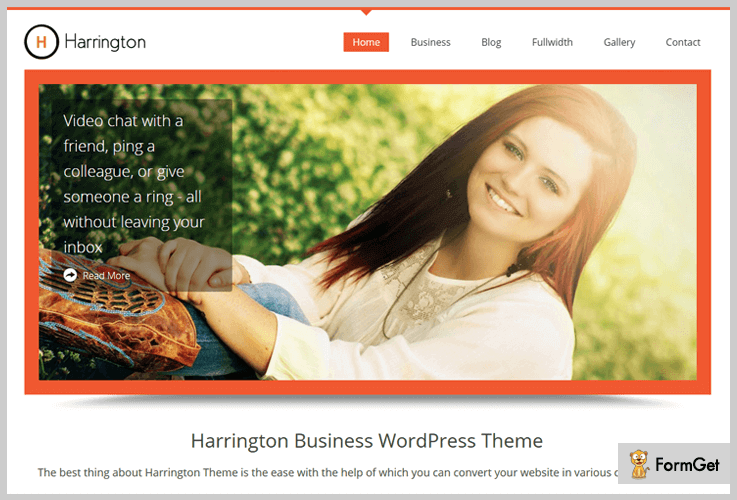 Harrington is well – known theme due to its handy and easy to use features. This theme is suitable for all kind of websites. It has a full-width slider, where you can add images and their descriptions. It also has search bar option and a blog section where you can update the latest posts and write blogs. With 3 star rating and 200+ active installations, this theme will cost you nothing as it is available free of costs. It has microformats, a type of open source data format created upon widely used frameworks. This theme is polyglot or multilingual with the help of plugins whether of WordPress or some other. Using this theme, you can have 6 widgetized area – 2 in the sidebar and 4 in the footer area. Also, it has an admin visual editor, which will help you with customization of the menu. 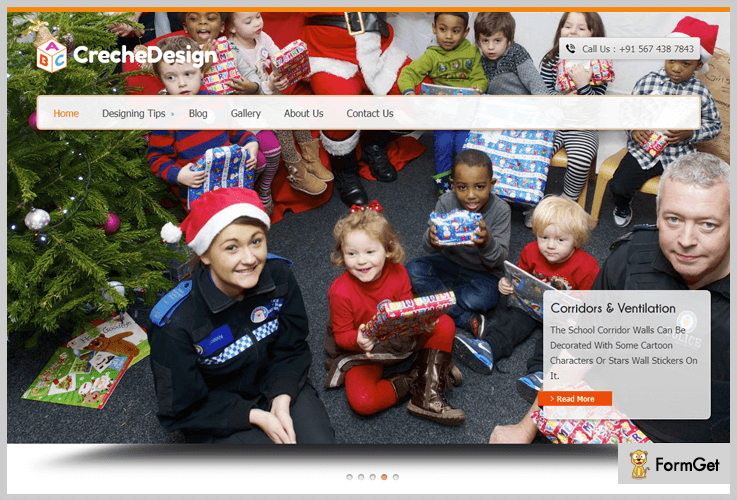 These are the 5+ School WordPress Themes best suitable for pre-school, playschool, kindergarten, high school, universities, etc. We try to put on all the new and best features of each theme. All paid themes are SEO optimized and made under developer license, even the free themes are really amazing. Also, you can have our InkTheme membership at $49 per month with lifetime accessibility and 24*7 support. If you like our blog, do share your reviews!